Before “flipping the classroom” was a recognized pedagogical practice, I, like others, was looking for ways to hand students a spatula. In what now seems like very primitive digital pedagogy, I first experimented with what I called the VicWik. For several years, members of my literature classes created teaching materials to enrich our class discussions of Victorian novels and inspire visitors to our site. We quickly learned what most of you now know. First, digital projects require good partners; in my case, staff and students in the University of Iowa SITA, or Student Instructional Technology Assistance program, shared their technical and pedagogical expertise. Second, going public—in our case the simple act of making the wiki visible to anyone with internet access—demands unexpected forms of accountability. Having violated every possible form of copyright with that initial post, we were forced to keep what I quickly labeled the “pilot” VicWik site private. The intersections between digital and public work became painfully clear. In the next class, I spent far more time explaining not only copyright and intellectual property but also the respect and credit at the heart of successful collaborations. Even at the level of citation and permissions, students began to see themselves as part of a learning community that extended beyond the class. As a result, they transformed the myopic process of gathering information and writing an essay for a single instructor into engagement with an imagined public of fellow students and Victorian enthusiasts. A glimpse at the VicWik site suggests how invested the students were in the process and how creative they became at the promise of a public audience. They created galleries to demonstrate the long life of Mary Shelley’s monster, designed a soundscape for Rudyard Kipling’s Kim, debated film adaptations, and unearthed parodies. The site looks simple by current standards, but students’ desire to address readers through a digital platform linked them with each class that followed and preceded their own, as well as with potential, invisible readers. Their passion inspired me to shift from the virtual public space of the internet to the physical public spaces of Iowa City where I designed a course called Capturing Animals—in Literature, Art, and Culture with our local Iowa City Care and Adoption Center. No longer satisfied with a public pedagogy, I longed for the more intimate, visceral, and, I assumed, effectual impact of publicly engaged pedagogy. At that point, the two approaches seemed adjacent rather than attached. During those same years, I was often in conversations with these two distinct academic audiences. In libraries, digital workspaces, and one set of conferences, I encountered digital humanities scholars. In classrooms, liminal spaces where academics and community partners collaborate, and a very different set of conferences, I encountered advocates for publicly engaged arts and scholarship. Increasingly, however, artists, designers, scholars, and community-based experts are finding common ground. After a gradual recognition of shared interests and obstacles over the last decade, the rush of political activism spurred by the last election sent many members of both groups into the streets. 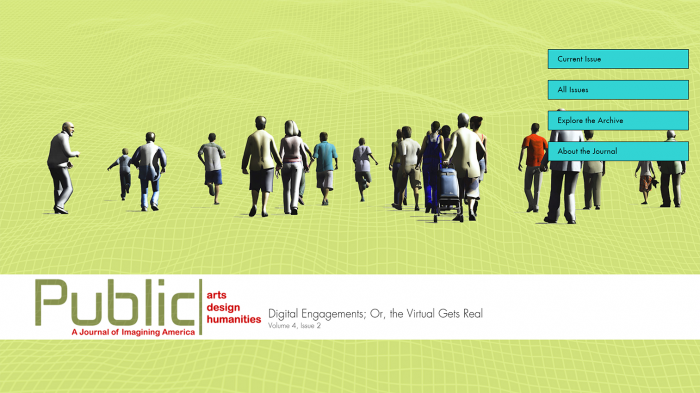 The drive to mobilize disconnected communities with speed and efficiency also accelerated collaborations among digital and publicly engaged artists, scholars, and activists. The diverse, concentric circles of artists, designers, and scholars within these sometimes disparate groups had already stumbled upon similar questions. Most immediately, many of us discovered our previous career goals chafed against a deepening commitment to public practice. At conferences such as Imagining America, we started asking, what do students, community artists, designers, humanities scholars, administrators, legislators, funders, and citizens generally accept as real work when they plan, conduct, praise, condemn, and evaluate activities, insights, outcomes, and impact? Many of us agree that higher education is a cornerstone of civic culture. Yet once we step outside of the bounds of the print books and journals, juried exhibitions, or stage productions long accepted as the legitimate products of knowledge makers, when is and isn’t digital and community-based work real to us and to our colleagues? One reason that question is hard for digital and publicly engaged knowledge creators to answer is that for us work is more verb than noun and more collective than individual. Final products matter less than a thoughtfully iterative, ongoing process rooted in a willingness to fail, listen, reflect, self-correct, reimagine, revamp, then repeat. What digital and engaged artists, designers, and scholars share with colleagues working in more conventional forms is a desire to have a significant impact. But whereas many of us were trained to influence our immediate intellectual communities, publicly engaged digital artists and scholars seek not merely to influence colleagues but to interact with larger, more varied audiences. That shift reorients individuals’ perceptions of their disciplines. As we see in many of the contributions to this issue of PUBLIC, the primary commitment of engaged thinkers and creators is often to use the lenses and practices of their disciplines as their contribution to a collaboration driven by a public purpose rather than using their expertise to satisfy the expectations of their disciplinary communities. In a colloquial sense, this issue asks how knowledge makers in the digital world and IRL (internet slang for “in the real world”) work in ways that are not just visible topublics with internet access but also engaged with publics. The first step in the process is to realize we are “the public,” or more intersectionally, that we are participants in multiple publics. Nineteenth-century literature scholars (like myself) long ago rejected the Victorian notion of “separate spheres.” We realized that the domestic sphere was a subset of the public sphere, not a world apart. Middle-class Victorians had used that formulation to argue that “respectable” women would be tainted by participation in politics and commerce. Academics similarly deceive themselves when we speak of academe apart from “the public” or “the community.” We may be a subset of our local communities, but recognizing our place within communities is a crucial first step in clarifying our civic responsibilities as educators and knowledge creators. Ironically, when artists, designers, and scholars enact those responsibilities by using their expertise creatively and collectively with and for their communities, they are sometimes surprised to find themselves producing their most innovative, exciting work and doing so with a profound, exhilarating sense of purpose. The contributors to this issue are students, academic staff, and faculty members, and they write from their vantage point in higher education, which leads to another shared question about real work. In academic arts and humanities contexts, colleagues assume real work is only done by individuals. Both digital and engaged work require collaboration. Those partnerships frequently cross the boundaries of disciplines, institutions, and sectors. Collaboration is an art in itself—demanding not only skills and best practices but frank discussions of power relations, hierarchies, “credit,” strengths, weaknesses, missions, boundaries, expectations, and outcomes. Artists, scholars, and community partners who want to work with communities or/and to expand beyond print formats find themselves partnering with designers, technologists, archivists, project managers, activists, and community experts who draw from experience and practice as well as theory to create contingent, co-led teams and spaces. When you step outside your areas of expertise, you open yourself to unpredictable vulnerabilities, and when you work with others—like children, immigrants, or people of color—you can unintentionally put them at risk. Publicly engaged artists and scholars must negotiate with the frustration of partners from nonprofit and business sectors who can feel hidebound by the temporalities of higher education. When feminist, queer, and critical race theorists make their digital work public, they brace themselves for vicious trolls as well as appreciative, interactive audiences. Colleagues who do not venture outside conventional disciplinary practices can be utterly oblivious to these complications and to the labor required for successful digital and community collaborations: new skills, new vocabularies, relationship building, planning meetings, trust building, damage control, group reflection, and revision. Our contributors rely on the growing resources for and research on intersectionality in digital engaged projects. While this space does not allow me to do justice to that work, I can highly recommend several entry points to scholarship, assignments, manifestos, and tough conversations about race, class, gender, sexuality, ableness and disability, and access for digital and publicly engaged artists, designers, and scholars. Coeditors Rebecca Frost Davis, Matthew K. Gold, Katherine D. Harris, and Jentery Sayers assembled Digital Pedagogy in the Humanities: Concepts, Models, and Experiments, hosted by the Modern Language Association Commons. This resource is an invaluable set of keywords with a treasure trove of recommended readings, sample projects, and assignments. FemTechNet is one of the most energetic communities committed to social justice and dedicated to publicly engaged digital arts and humanities. Among the many resources they offer, the online SCALAR FemTechNet Critical Race and Ethnic Studies Pedagogy Workbook is a live document that includes sections on Intersectionality and Community-Based and Publicly Engaged Learning Projects. The editors are the members of the Critical Race and Ethnic Studies Committee of FemTechNet, Anne Cong-Huyen, Christopher Rodelo, Erica Maria Cheung, alex cruse, Regina Yung Lee, Katie Huang, George Hoagland, Dana Simmons, Sharon Irish, Amanda Phillips, Veronica Paredes, and Genevieve Carpio. To get a sense of the brilliant projects on African American history alone, plunge into the list of “Black Digital Humanities Projects and Resources” gathered by the Colored Conventions Project, a group represented in this issue. Roopika Risam’s “living document,” “Creative and Critical Precepts for Digital Humanities Projects,” includes a helpful bibliography and list of social justice digital projects. Claire Battershill and Shawna Ross recently published Using Digital Humanities in the Classroom: A Practical Guide for Teachers, Lecturers, and Students (Bloomsbury 2017). The web companion to the book provides a wealth of resources, including a section of publicly engaged dissertation projects. And, of course, HASTAC(Humanities, Arts, Sciences, Technology Alliance and Collaboratory), initiated by Cathy Davidson and Theo Goldberg, and now co-administered by one of our contributors to this issue, Jacqueline Wernimont, is a place where conversations about engaged digital practice continue across generations of thinkers, makers, and users. For all who work in virtual spaces and physical community settings with a commitment to publicly engaged knowledge-making, this issue of PUBLIC documents how richly these two pedagogies and practices increasingly inform and mutually transform what we do. They give me great hope for the future of higher education and the many communities of which we are all a part. We hope you’ll join the conversation. In the act of collaborating, in physical proximity or through digital mediation in which “products” become a moving part rather than an end—what do we consider real? What do we “count” as real? And what are we going to do when kinds and forms of work we believe are critical to investigating twenty-first-century questions do not pass muster as real work by people and institutions positioned as gatekeepers in our colleges, universities, communities, or legislatures? Who would have imagined in 2017 that naïve overconfidence in the neutrality and objectivity of data would flip-flop to naïve dismissal of all data as “fake news”? Both Front Matter pieces address the ethics of engaged digital practice—focusing on the politics of data creation and deployment. In “Creating Matrixes for Carework in Digital Cultures,” Jacqueline Wernimont makes the case that the iterative, non-binary process represented by the figure of the matrix invites our compassion and care for the intertwined bodies, labor, and emotional costs of digital projects. In “Cultivating a Data Mindset in the Arts and Humanities,” Catherine D’Ignazio and Rahul Bhargava offer tools, design activities, and workshops for the “data literacy” we need to identify and disrupt data inequities—another way to approach both data and digital collaboration ethically. The contributions to this issue’s Principles and Practices section highlight a variety of methods, platforms, and formats. They also span cultures, continents, and generations, often bridging differences through forms of storytelling. Social media, including video and visual tools, have become second nature for teenagers who have access to the internet. Several of our contributors draw on that expertise with projects in which young people explore their experiences of race, economic inequities, and social stigma. In Providence, Rhode Island, Alexandrina Agloro worked with young people and local community organizations to design a transmedia alternate reality game, balancing the intimacy of human connection with the design demands of gaming. The project she describes in “An Alternate Reality Game, Participatory Politics, and the Color of Civic Engagement” addresses the whiteness of both digital cultures and civic-engagement work. Agloro also provides a mini-toolbox for scholars of color interested in building community-based collaborations. Across the globe, Rulon Wood and his graduate students partnered with young South Africans on a project he describes in “Community-Designed Anti-Stigma HIV Campaign: A Case Study in the Co-Construction of Digital Interventions.” After observing the failure of campaigns targeted “at” these young people, Wood and his students led workshops in which American and South African students worked side by side, choosing to create poetry and public service announcements to share via social media. Another group of contributors discuss the challenges of building a foundation of trust and understanding strong enough to support projects between communities defined by shared labor or race-based histories, on one hand, and teams of campus researchers, including scholars and artists, on the other. The relationship-building skills that make civic engagement possible prove to be as critical to the success of publicly engaged digital work as to community-based work. Digital storytelling once again emerges as an especially promising technology in these projects. Elena Foulis and her students use video-narratives to bring oral histories to life in their collaboration with Latina/o communities in Ohio, the subject of “Oral History in the Digital Era: Oral Narratives of Latin@s in Ohio.” Mollie Godfrey and Seán McCarthy confront the difficulties when faculty and students from a predominately white university and a largely black community unearth local history, especially in the rural South, in “Celebrating Simms: Complicating the ‘Single Story’ in Community-Engagement Projects.” Working together, they constructed a physical and digital exhibit to document the legacy of a formerly all-black high school in Harrisonburg, Virginia. Conflicting opinions about environmental issues can also divide communities. Elizabeth Rush and her students also planned a project with a rural community, this time in Maine. Students recorded and circulated community members’ climate stories. They share their own discoveries in “Climate Change and the Stories We Tell: The Making of a Collaborative Digital Archive in Rural Maine.” Rush and her partners also offer a frank account of the tension between community-engaged approaches to learning and digital pedagogy. In the final essay of this section, “The Art of Transformation: Cultural Organizing by Reinventing Media,” coauthors Frank Anderson, Beverly Bickel, Lee Boot, Sherella Cupid, Denise Griffin Johnson, and Christopher Kojzar reflect on their experiments with MapTu. Using this crowd-sourced platform, they are designing collaborative, 3-D learning spaces that function as what they call “virtual public squares.” Not surprisingly, those spaces are as complicated and productively contentious as any community Speakers’ Corner. We include two projects in the Case Studies and Resources section. Recognizing the growing interest across disciplines in digital publicly engaged courses, Valerie Holton, Laura Gogia, and Tessa McKenzie began working with community stakeholders, training doctoral students via an online course that asked students to be both theorists and practitioners. In “Collaborative Curiosity: A Connected-Learning Course on Community-Engaged Research,” they reflect on the need for courses grounded in “digital participatory culture” and document the transformative effects both on those who teach and those who take the class. Richard Blissett and Dominique Baker bring us back full circle to many of the questions and ambitions raised throughout this issue. In “Seeing Is More than Believing: Visual Media, Social Media, and Anti-Racism on College Campuses,” they show how what began as a local college protest, the 2014 #itooamharvard Tumblr campaign, exploded across 40 campuses almost overnight. The hashtag originated from a classroom project when students of color found a creative way to express their alienation, often picturing themselves with a racist comment made by a white classmate, instructor, or local community member. Blissett and Baker ask how and why new forms of visual and social media have been and can be critical to teaching against racism, as they discuss this digital project that morphed into ongoing nation-wide and even international publicly engaged digital social justice work. Theresa Donofrio also pulls together a number of this issue’s threads by considering the rhetorical stakes and opportunities for civic participation in her book review of Participatory Culture in a Networked Era: A Conversation on Youth, Learning, Commerce, and Politics. We are especially delighted to share a new Gallery feature in this issue of PUBLIC. People are finding so many inspiring and creative forms for publicly engaged digital work that we were determined to offer at least a sampling of additional projects. The Gallery includes interactive tours, cocreated archives, audio interviews, and immersive theater. It also suggests the participatory potential of mapping projects—from maps of Islamophobia to Indigenous memory maps to urban collaborations in which citizen-scholars deepen their knowledge of local community matters, from housing costs to cultural resources. I close with gratitude for the network of artists, designers, scholars, and activists who made this issue possible. Jan Cohen-Cruz, a visionary founding editor of PUBLIC, kindly invited me to develop this issue. Kathleen Brandt and Brian Lonsway, the other two founding editors, have been wonderful partners in imagining the issue. Both are stunning designers. As the new Managing Editor, Kathleen has been an inspiring, generous partner in creating this issue. I’m also grateful to copy editor Judy Susman, proofreader Sarah Pohley, layout editor Lynn Wilcox, and Syracuse University Libraries liaison Suzanne Preate for their thoughtful, insightful shepherding of the contents of the issue. The other silent laborers are those reviewers who gave generously of their time and expertise by providing careful, crucial responses to the many submissions we received. Finally, a warm, heartfelt thank you to the contributors. I hope you will find their work, their reflections, and their ambitions as stimulating as I do.